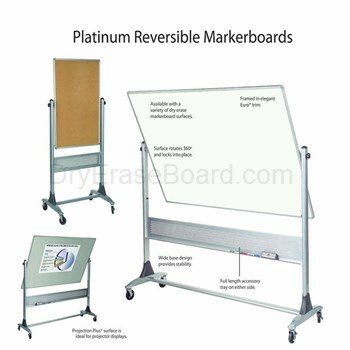 Add a versatile option for trainings, meetings and classroom work with this platinum reversible board from DryEraseBoard.com. With a two-sided design that easily flips over, you get twice the drawing and display surface area in half the space. Plus, the wheeled, platinum base offers both a contemporary look and convenient portability. 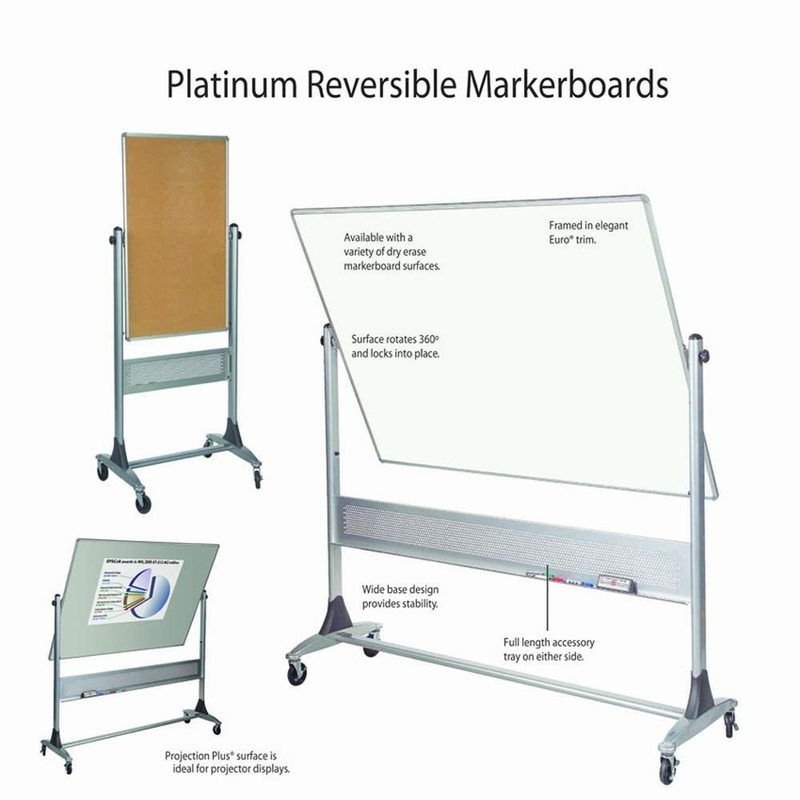 Each of these platinum reversible dry erase whiteboard presentation easels has three-inch locking casters and a wide, sturdy base that allow you to safely anchor your marker board when necessary. In addition, the unit includes a perforated steel accent panel with a full-length tray, giving you a convenient spot for storing erasers, markers and other accessories. At DryEraseBoard.com, we offer a variety of size and surface combinations in order to meet your needs. Choose whether you�d like one side of your board to be cork for a handy display area. If you�d like a drawing surface on both sides, you get the choice of our economical Dura-Rite with a 20-year guarantee or a durable porcelain steel surface with a 50-year guarantee. We also offer projection-compatible whiteboard surfaces which allow you to use the whiteboard for projection-based presentations. The hinged design makes it easy to flip over to the other side whenever you need to regardless of what surface type you choose. Whether you�re working in a classroom, a meeting space or a boardroom, each of these options offers a clear, crisp display on a stylish platinum base. Find the right size and surface combination for your platinum reversible board by checking out our selection online at DryEraseBoard.com. We�re here to help you get the most out of your platinum reversible dry erase whiteboard presentation easel, so contact us with your questions today.